As a kindergarten teacher, my answer to this question is “as early as possible!” While some people may think keyboarding is too advanced for children of this age, my students have proven again and again that they are more than up to the task. Although today’s generation is considered “digital natives,” oddly enough, my class used to have regular technical difficulties with the computers. Students would accidentally (or maybe not so accidentally) shut the computer off, or not know how to use it. Since we started using engaging computer games, those problems have mysteriously disappeared. In our school, students are expected to take tests on the computer as early as 1st grade, so the earlier we can expose them to computers, the more time they will have to get comfortable with the tool before they are graded on their performance. I’ve set up a computer station in my classroom with five computers all around one table. Each day a different group of students gets to work at the computer station for about an hour. My students use TypeTastic because it’s fun (and free). The games are exciting and colorful, which is a real attention-grabber for kids—and it incentivizes them to play! Through these games, kids must choose the right key to hop over lily pads, build construction projects, and pop bubbles in outer space. 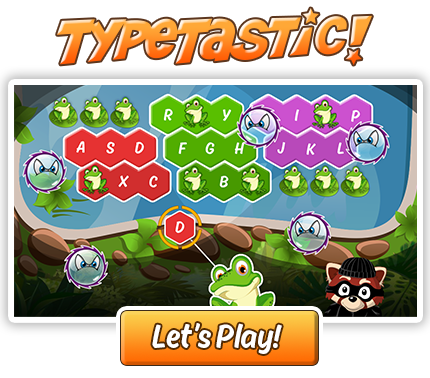 Learning to type is easy with TypeTastic! Beginners start by getting familiar with the keyboard and learning key locations by using their mouse (or a touchscreen). From here, one-finger typing is introduced, leading into more complex scenarios. Never Hear “This is Boring” Again! My kids love the games so much they hardly even realize they are learning a skill that will be with them for the rest of their lives. When students are working at the computer station, they’re very collaborative and help each other locate keys and advance to new levels. The different levels within the games allow students to continually challenge themselves. The variety of different games keeps them from getting bored. It’s a challenge to unlock the next level, and the more challenges they have to overcome, the more it holds their attention. The games not only help students learn important computer skills like operating the keyboard and mouse, but they also reinforce alphabet and letter-identifying skills. This is especially important for our ELL students—56% of students at our school are either Spanish-speaking or from another country. Like I said before, there are people who assume that kindergarten is too young to teach typing skills. However, I think this assumption underestimates these young learners! They are at an age when their curiosity is at its strongest. Everything is new and exciting, and they will try anything as long as you make it fun. With typing being such a fundamental skill in our increasingly digital world, I’m so glad I’ve found a tool to help my students get a head start in this arena! Kelly Rotzinger is a kindergarten teacher at Marion E. Cahlan Elementary School in North Las Vegas. She has been teaching for 12 years, nine of which have been in kindergarten. Follow Kelly on Twitter @KellyRotzinger. ← Teachers Share Why They Love TypeTastic!